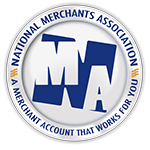 National Merchants Association is a global merchant advocacy group and a leader in merchant services dedicated to helping merchants and agent partners grow their businesses by generating sales opportunities and maximizing profits. National Merchants Association works on behalf of businesses to eliminate the unnecessary and unreasonable fees associated with accepting electronic transactions, as well as provide the products and services to help them continue to be successful. VisitÂ www.NationalMerchants.comÂ or call 866-509-7199.